President Barack Obama delivered a forceful defense of the nation's safety net programs, and vowed to expand gay rights and tackle the problem of climate change in his second inaugural address Monday afternoon. The speech was a bolder and more specific defense of the president's liberal governing vision than the address he gave four years ago. 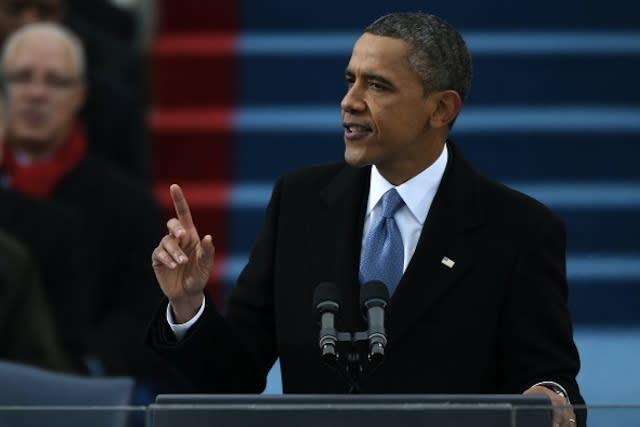 For his first inaugural address, Obama stuck to a broader outline of his ideals and called on politicians to overcome partisan differences and work together in the face of economic crisis. On national television and before a crowd of hundreds of thousands of spectators who descended on the Mall, Obama staunchly reiterated his belief that gay people should be allowed to marry. "Our journey is not complete until our gay brothers and sisters are treated like anyone else under the law–-for if we are truly created equal, then surely the love we commit to one another must be equal as well," Obama said. He also mentioned the gay rights Stonewall Riots of the 1960s in the same breath as the Selma civil rights marches. In the same section of the speech, the president made oblique references to gun violence, equal pay for women and immigration reform. He called for "all our children, from the streets of Detroit to the hills of Appalachia to the quiet lanes of Newtown" to be kept safe from harm. The president did make a plea for bipartisanship and unity. "My fellow Americans, we are made for this moment, and we will seize it — so long as we seize it together," Obama said. Earlier in the speech, Obama said to avoid the problem of climate change would "betray our children and future generations," signaling he may also make that issue a key piece of his second-term agenda. He abandoned efforts during his first term to push for so-called "cap and trade" legislation to curb greenhouse gas emissions. The president challenged critics who have argued that the government must reduce its spending and cut back on social welfare programs, including Obama's health care reform law. Obama said that the country must reduce its deficit, but that the nation must work to protect equality of opportunity, in what seemed to be a reference to his battles with congressional Republicans over taxing and spending. "We are true to our creed when a little girl born into the bleakest poverty knows that she has the same chance to succeed as anybody else, because she is an American, she is free, and she is equal, not just in the eyes of God but also in our own," he said. Obama argued that the nation's entitlement programs make America stronger because they protect this chance at equality. "We recognize that no matter how responsibly we live our lives, any one of us, at any time, may face a job loss, or a sudden illness, or a home swept away in a terrible storm," Obama said. "The commitments we make to each other–-through Medicare, and Medicaid, and Social Security--these things do not sap our initiative; they strengthen us. They do not make us a nation of takers; they free us to take the risks that make this country great." The president also warned in the 2,095-word speech that the country cannot succeed if a "shrinking few" succeed economically while the middle class suffers.